Flowers attract all kinds of beneficial insects – not just bees and butterflies but also predatory insects such as hoverflies and ladybugs. Together they help to boost harvests and keep common pests like aphids under control. 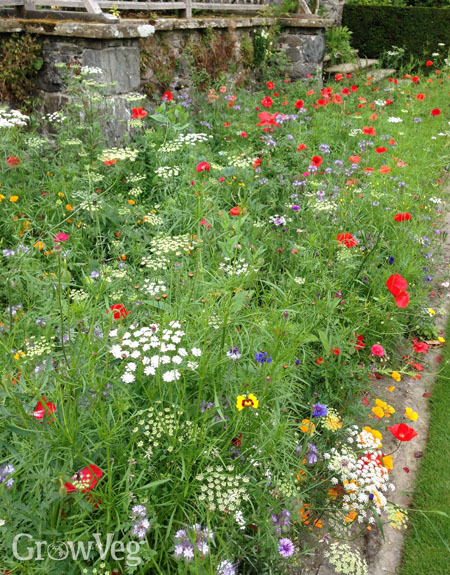 Another option is to sow a wildflower mix onto empty ground. Cornfield mixes are excellent for this purpose, providing a riot of color with an accompanying throng of insects mere months after sowing. Rake dug over, weed-free soil to a fine tilth then broadcast the seeds evenly over the surface. Rake again so the seeds are in contact with the soil then pat the surface down with the back of the rake. If it’s dry, water the sown area to speed germination along. The seedlings should appear within a couple of weeks.